SnipSnap, the server that runs used to run this site, supports themes. 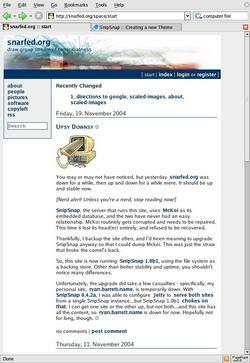 They change your SnipSnap-based site’s appearance, using CSS, images, and other files, without changing its content. There’s a tutorial on snipsnap.org. 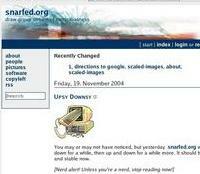 The snarfed.org theme is available for download. To try it out on your site, download snarfed_theme.snip, go to your SnipSnap’s setup page, import it, and set it as your theme. Voila! This theme is licensed under the Creative Commons.